Mass is measured in grams. Volume is measured in cubic millilitres. Weigh the object to find its mass as usual. 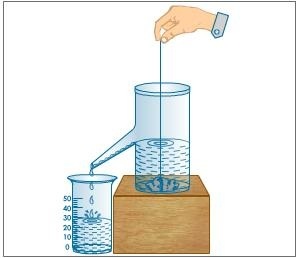 Pouring water into two measuring cylinders is a method of finding the displacement. The reading must be taken at the lowest level of meniscus (the curved upper surface of a liquid) or curved surface of the liquid.